It's been forever since I last posted a furniture makeover right? Well truth be told I have a couple (okay more like 4 or 5) of furniture'y projects done, but with the big move and just life in general its taken me this long to have edited the photos! So these pics were taken at the previous house. 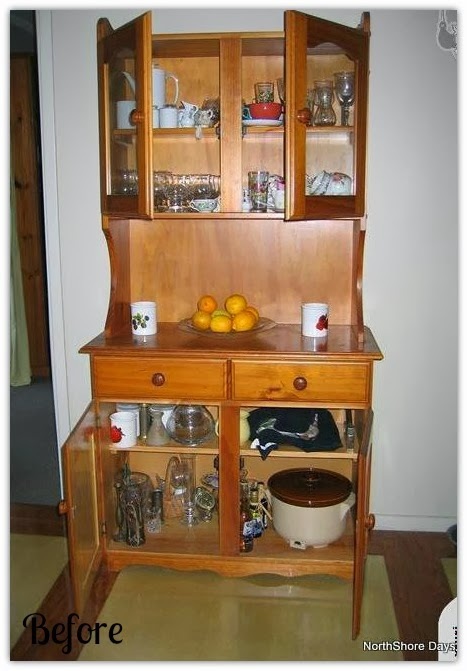 I found this sweet wee hutch on Trade Me and just knew it had to be mine - I won the bidding war up to around $90. Wow how lucky was I? These hutches usually go for heaps more. This is the seller's photo on the listing. The ad stated that there was some damage to the varnish, turns out it was an auto pest control spray that had eaten through the varnish and made it all soft and sticky. So we had to get to work scraping off the yucky top layer. Then I realised that, oops the hutch was just slightly too big for the kitchen so I got Sean to trim the edges, before I started painting. Yes, white!!! If you have followed me from the beginning, you'll know my love for white! 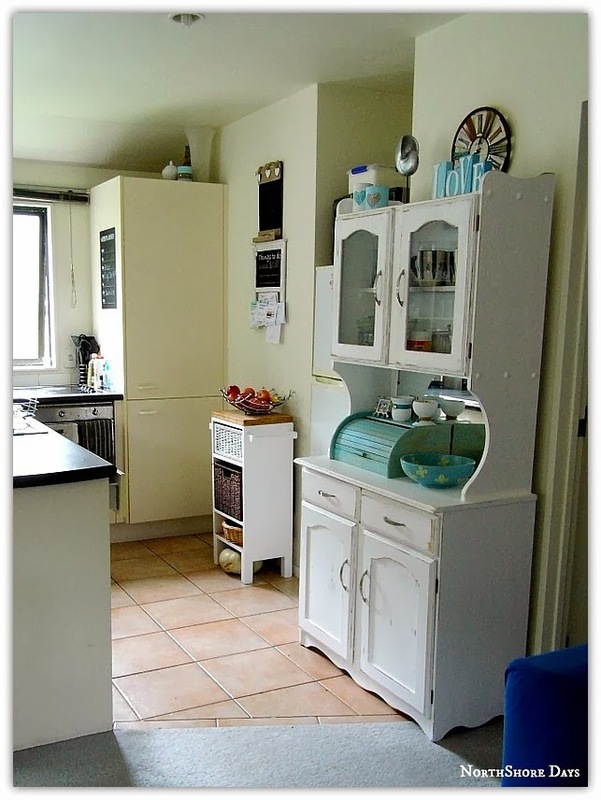 Anyway, I painted 3 coats of white Dulux paint and sanded and distressed the whole unit. I removed the glass and gave it a good clean too. Beautiful! How awesome are these handles? Perfect for my hutch and at $3 for 3 in the bargain aisle...yes please! When I decorated with all my treasures, I realised something was missing. I mulled on it for a day or so then remembered the chippy old mirror I had propped against the bedroom wall. This cabinet is so totally my style and it turned out heaps better than I imagined. It was a perfect fit in my little kitchen. Now it's gorgeous in the living room. This has to be hands down my favourite piece in my house. Thanks for visiting, pop back soon and see what else I've made over lately. It's time for the big reveal - I cant wait to show you what I made from the gorgeous bead soup that my partner Claire from Saraccino sent to me. We had to use the clasp and focal but we could also incorporate our own beads if we wanted. I was lucky to have a beautiful hand made clasp and focal in my absolute favourite colour. I used the clasp as the focal point of a bracelet, I added my own round silver charms and the peace charm. I LOVE it on, its perfectly "me"
I decided on a simple necklace using the multi-faceted, coloured glass beads. They literally do "shine". Again I chose to create a very simple piece with these blingy beads, I joined them using double jump rings. A perfect match to the "Shine" necklace. I have to admit, I'm not a big earring maker, so I am really happy with this pair using the matchy vintage style green beads. Claire included beautiful blue handwoven silk from Thailand and I knew exactly what I wanted to do with it. I see these bracelets all over blogland and I wanted one for myself... I included the charms from my collection to accent the style. I made this simple and feminine bracelet with memory wire and the clear beads and the blue cord. I added the white flower beads from my stash. It has such a calming feel about it. Claire handmade this shell focal too, isn't it just beautiful? You know my style is beachy so this necklace fits the bill perfectly. My absolute favourite beads from the whole soup are these 2 faceted mayan-blue rondelles. They are just gorgeous, so I made them into very simple earrings for myself. My favourite piece though, has to be this necklace, it was the first thing I made, the same night that I received my soup! LOVE!!! Included in the soup were these teeny tiny seed beads and glass tear drop beads. I threaded the seed beads onto very thin wire in a figure of 8 then folded it in half to make 2 circles. I used silver nail polish to add a touch of sparkle to the earrings. 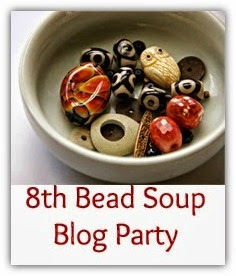 I still have a number of beads left over to play with and I'm sure you will see them on my blog very soon. I had so much fun with this soup and I hope you have enjoyed all my creations.